No quick getaways in India | Where to next? You wouldn’t want to be a bank robber in India. Your chances of getting away with the loot are absolutely zero. In fact, snaking through the maze of traffic, whether in town or the countryside, is rather like running a slalom race uphill wearing concrete shoes. Even in a short stretch, you are likely to encounter pedestrians, tuk-tuks, rickshaws, tractors, cyclists, motorcyclists, pushcarts, street vendors, processions, dogs, camels, donkeys, cows and the routine traffic of cars, buses and trucks. Elephants are less common. 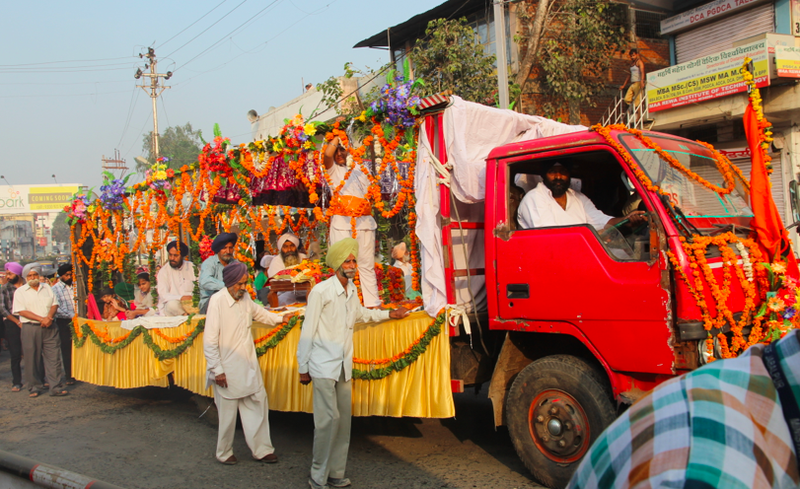 When we tried to drive out of Jabalpur, we were initially held up by a long Sikh religious procession with floats, musicians, swordsmen, sweepers and masses of followers. Then came the railway crossing in the middle of town where hundreds waited impatiently for the train to come and the boom gates to rise. But many pedestrians and cyclists ignored the gates and scooted through anyway as the train approached. It took us ages to creep through bustling Raya, with everyone jockeying for a better position in the snarl of traffic. At least we had a lot to look at. Ad hoc shops and workshops were set up on both sides of the railway tracks on our left. Plenty of local trains trundled past and we waved at the passengers, who waved back. A couple of hours and a couple of kilometres later we realised the road crossed the tracks, with very few vehicles slipping across between trains. No wonder we had inched ahead so slowly. Pedestrians and animals make for an interesting challenge. People generally walk with the traffic, so have no idea what’s bearing down on them. Even a blaring horn doesn’t give them an indication because the smallest of motorbikes is often equipped with the loudest of horns. We’ve walked along roads on several occasions and it’s rather amusing to hear an approaching horn and then try guess what vehicle it goes with. 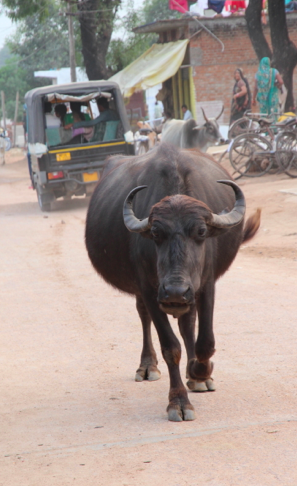 Cows, buffalos, dogs and pigs are equally likely to be walking on the edges or middle of the road. The night we flew in to Jabalpur, the taxi to town swerved around 10 to 15 cows lying in the road. It helps to know how wide your load is BEFORE you try to pass. Check out how wide the road is! Passing requires spatial awareness, nerve, speed and a horn! I’m guessing vehicles without horns are deemed unroadworthy. All trucks and tuk-tuks (called autorickshaws) have painted signs on the back that say ‘Horn Please’ or ‘Blow Horn’. A laying-on of horn lets them know you want to pass. Anand is good about giving a simple toot-toot before passing, but the majority of drivers think a continuous blast for at least 30 seconds is infinitely more effective. Some drivers are just idiots. We saw an official have his driver stop the car in the middle of the road, hop out and stop an oncoming truck, then proceed to inspect the truck’s load without making any effort to park either vehicle out of the way of traffic. There was nearly a collision when vehicles travelling from opposite directions tried to pass the parked vehicles at the same time. Then there are the roads themselves. Gravel and dirt roads are common and generally not too bad. 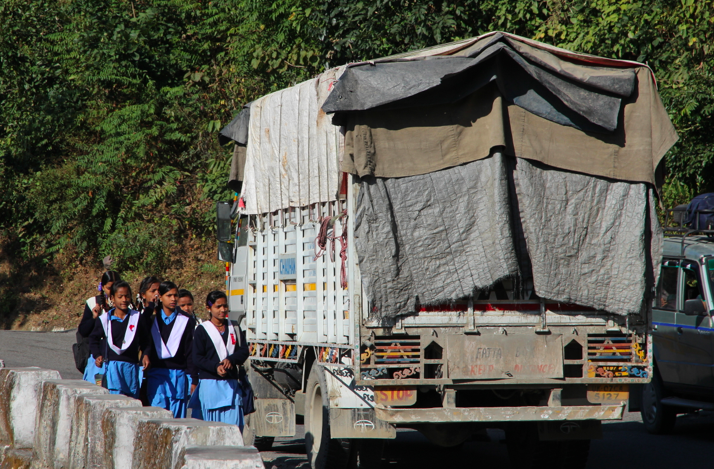 In Uttarakhand, one of the states we’ve visited, less than one-third of its 33,000 kilometres of road is paved. Roads with broken tarmac are the absolute worst. We brace ourselves and Anand takes a white-knuckled grip on the steering wheel as we bounce along the irregular surfaces, which can go on for long distances. Note to self: remember to wear a sports bra on these adventures. Because road quality can be so poor, it’s not uncommon for vehicles to weave back and forth across the road in an attempt to miss the worst of the gigantic ‘potholes’ and drop-offs. As a consequence, it is disarming to see several vehicles approaching you head on. Speed bumps get thrown into the mix, and Anand says villagers sometimes bribe road workers to add extra bumps, so children and livestock are less at risk. It’s not uncommon to have five bumps in a row. It’s only two months since the end of the monsoon, so road and bridge repairs are now common across the country. We’re often been diverted around a missing bridge and through a river that is no longer swollen with rain runoff. Some roads run through a small stream anyway. One morning, we saw a group of men building a brick wall to keep motorists from driving off the end of a road leading to a washed-out bridge. Anand said, They really ought to be fixing the bridge instead. Road closures have been problematic. One day we had to make a 100-kilometre detour because a new median strip prevented us from turning right. This morning we made a huge detour because a main road was closed after a fatal traffic accident. The locals set up a barrier after police and ambulances had come and gone. Anand says that it is not unusual for a fatal accident to become a village occasion. While the fatalities often have nothing to do with the village itself, the deaths bring everyone out to gossip, inspect the scene and mourn the victims. Such gatherings sometimes get out of hand and the Rapid Action Force has to be called in to disperse the crowd. Svetlana has been another ongoing problem. She’s the van’s GPS system and is named after my criminal doppelganger from Turkmenistan. 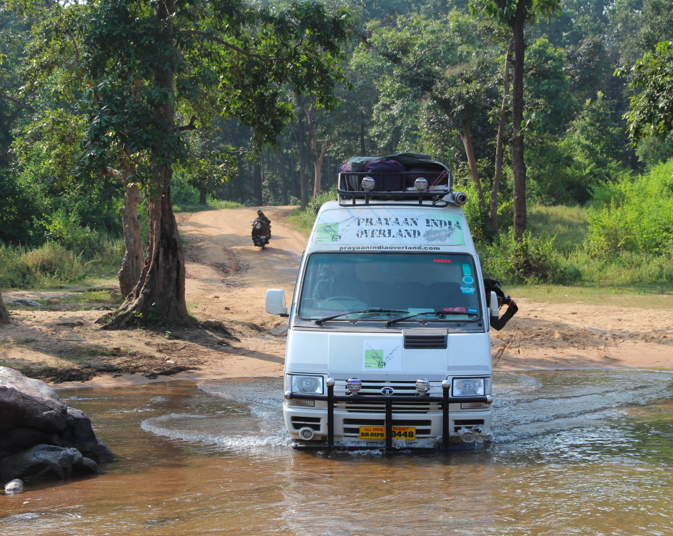 Every road in India is embedded in Svetlana’s database, and she’s programmed to take the shortest route possible, even if it’s a one-lane dirt road versus a national highway. We mostly ignore her pleas to turn right or left in whatever distance. That’s because when we get to the appointed turn, we can see that it’s a driveway or a lane than heads into a field of sugar cane. Svetlana has even tried to lead us through a shop. We’ve come up with a way for GPS systems to ingest a bit of humour into a drive. We reckon that after every 10 times we ignore Svetlana’s directions, she should be programmed to say something like Is anyone listening or I hope you’re lost. By the time we finish this trip, we’ll have zigzagged across almost 4000 kilometres of roads in central and northern India. I still keep wondering what’s around the next corner? Oh boy what a nightmare! Aren’t you glad you weren’t trying to drive it yourself? You are so right, Deb. 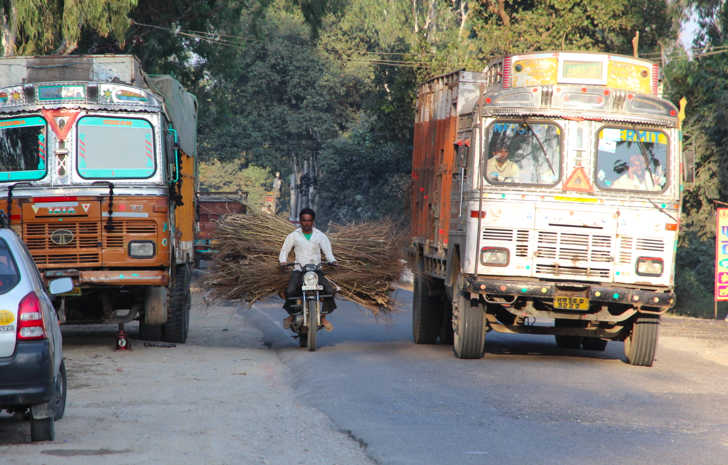 Driving in India is a nightmare, but mostly everyone drives slowly which helps a bit. Being a passenger is scary too. You certainly wouldn’t want to be an impatient driver or in a great hurry to get anywhere! I think this is where my habit of always travelling with at least one book would come into its own. I can wait anywhere for an indeterminate period if I have a book. The snow that has started falling through your blog is very pretty too. Travelling is pretty slow here, but the drivers are able to inch their way into the narrowest of spaces. Really amazing. 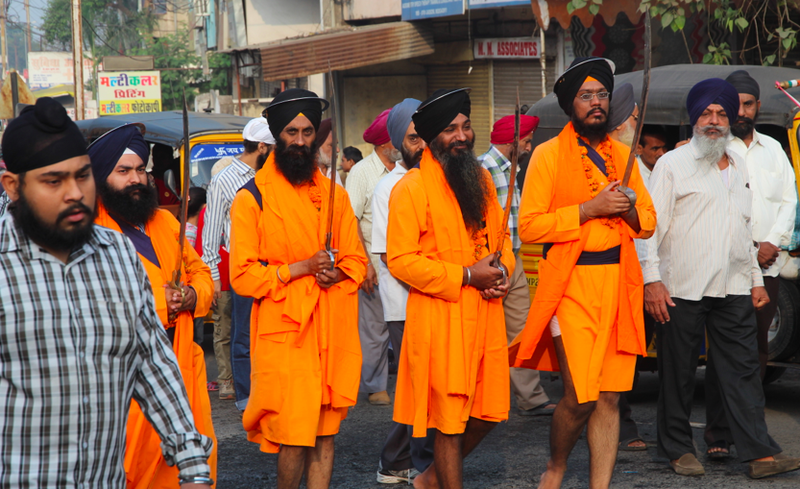 LP, excellent photo of the “Sikh swordsmen in a procession.” Kinda conveys don’t mess with us, which would be good enough of a message for me. Forgot about all the big traffic jams and ongoing processions on the streets (specifically recalling Madras). A good time to stop and talk to some people (Less any Sikhs with swords), grab a quick snack, a few snaps, etc. Deepti and Anand told me that the Sikhs in India often carry swords or daggers, but the only ones I ever saw were in this procession. Indian roads are really crowded. 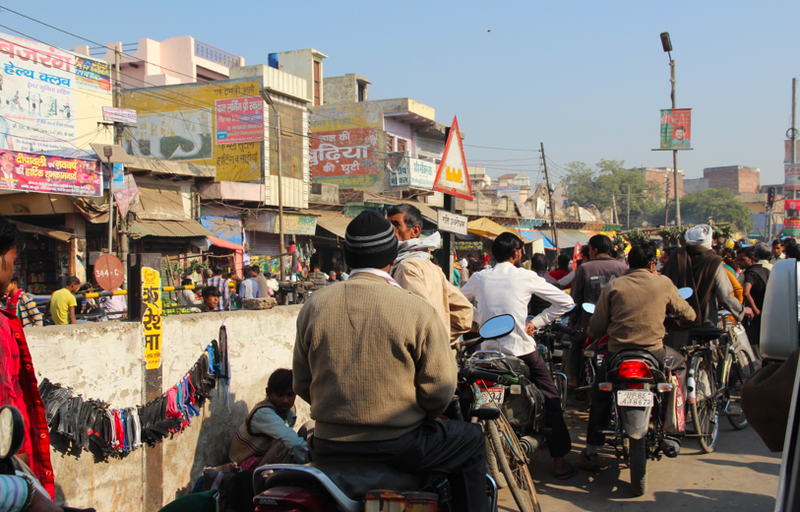 Car, buses, trucks, rickshaws, pedestrians, camels, cows…all find their place(s) here. I will never forget that coming home in winter from a 4-week trip in India I thought that something bad had happened: in Basel the streets were empty. I missed the life and the Indian colors very much.